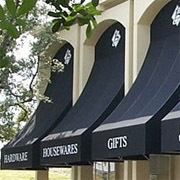 Awnings are perhaps one of the best ways to advertise your company or product. A well-designed awning not only improves the architectural appeal of your business but can also have great curb appeal. Awning-covered areas tend to soften the look of a building, and add warmth and attractiveness. Custom awnings can assist in adding a sophisticated look to almost any store front, while protecting your clients and tenants from heat and bad weather. Another benefit of commercial awnings is that they can extend the name or brand of your business and provide a great branding opportunity for the business owner. In many cases, a sign or window display may not be easily seen from the street. Awnings have high visibility and can be customized with your logo and business colors so that people can recognize and find your business with a single glance. So, whether you are a high-end restaurant or a small retail shop, Signarama of Huntington’s awnings can be fully customized to your tastes, while providing an easily identifiable “landmark” for your business. Signarama of Huntington’s custom awnings come in a myriad of shapes, sizes and colors. Contact one of our Signarama of Huntington’s designer’s today for a free estimate.